Prysmian Multicleats stainless steel cable cleats accomodate 34 to 110mm diameter single cables or 24mm to 145mm diamterer trefoil cables and are suitable for all types of cable route - the Multicleat bases are available in aluminium, cast iron and stainless steel. 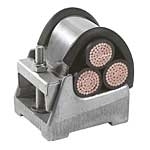 Stainless steel Prysmian BICON Multicleats can be used to clamp three cables in trefoil formation, single cables or bundles of cables to supports. Afumex LSF liners are available for use with stainless steel BICON Multicleats to prevent damage to EPR and "soft sheath" cables. Prysmian BICON Stainless Steel Multicleats provide excellent fire resistance surviving an excursion to +1000 degrees Celsius for up to 2 hours. Prysmian Multicleats short circuit withstand : standard 1.8m spacing = 43KA RMS (Peak 114KA), heavy 1.5m spacing = 50KA RMS (Peak 130KA), heavy 1.2m spacing = 71KA RMA (Peak 184KA). 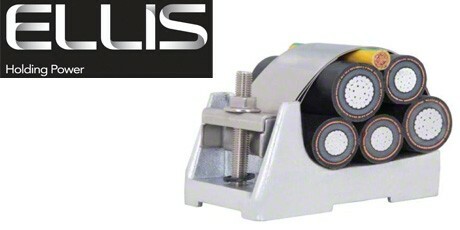 Ellis Patents Stainless Steel Varicleats feature 316 stainless steel cleat straps for long term service within contaminated and hazardous areas and short circuit withstand of 40kA (RMS (100kA peak). 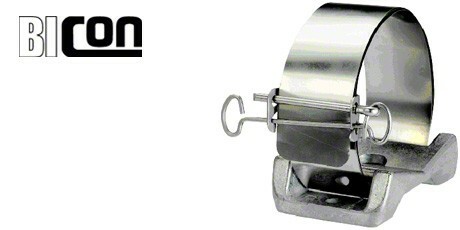 Stainless steel cable cleats are specified for low and high voltage cable support in the oil, gas, petrochem, power, offshore, marine, rail and construction industries. Video : Ellis Patents Cable Cleats vs Cable Ties (Stainless Steel) - In this video Ellis Patents compare using Stainless Steel Cable Cleats and Stainless Steel Cable Ties when subject to short-circuits. The Ellis stainless steel cable cleats and cable ties are used to restrain power cables on slotted rung cable tray and are short-circuit tested to 59kA RMS, 118kA Peak for 0.1 second duration.